Lithium ion batteries have been studied for many years and are present in our everyday lives in everything from laptop computers to electric vehicles. Li-ion batteries offer a very high energy density and specific capacity compared to other battery chemistries, which makes them very attractive for electric vehicles and other mobile and transportation applications. Although many requirements exist for batteries in all-electric vehicles, two of the most stringent and difficult requirements are a high energy density and the ability to fully charge in about ten minutes to compete with current fossil fuel technologies. Current batteries are unable to be quickly charged or discharged without causing irreversible damage, which shortens the life of the battery, and do not yet have the capacity to match the range of gasoline powered vehicles. Various chemistries have been explored to increase capacity and stability. However, few understand the transient strains and strain evolution that develops in the battery during operation. After it was observed that the electrochemical phase changes and strains that should occur in a battery have a lag time with respect to electrical output at high charge/discharge rates, the importance of understanding these transient processes became very clear. To better understand the processes which occur during operation, we use the Advanced Photon Source to observe phase changes and measure strains in real time in bicontinuous nickel inverse opal anodes developed by Dr. Jiung Cho, Mr. Junjie Wang, and the group of Paul Braun (University of Illinois at Urbana-Champaign). 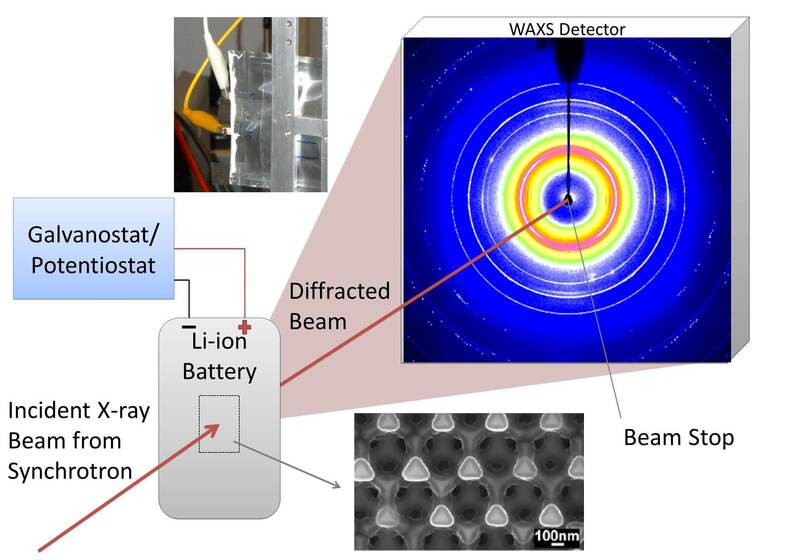 This will increase our understanding of how strain, phase transformation and electrochemistry interact and may be useful in guiding the search for better battery chemistries and material designs. It was recently discovered that structure on both the nanometer and micron scale can have a strong influence on both the stability of individual electrodes and the maximum achievable reversible charge/discharge rate. A popular family of anode materials which could benefit from novel structural approaches are alloying anodes, such as silicon and tin, which have very high theoretical specific capacities (around 4200 mAh/g for Si and 1000 mAh/g for Sn). Silicon and tin cannot currently achieve such high capacities due to the large volume expansions upon lithiation (up to 3-4X its original dimensions), which typically cause large scale cracking and pulverization after only a few cycles. This expansion induced damage causes a large amount of the anode material to lose electrical contact with the rest of the electrode after a few cycles, drastically reducing capacity. 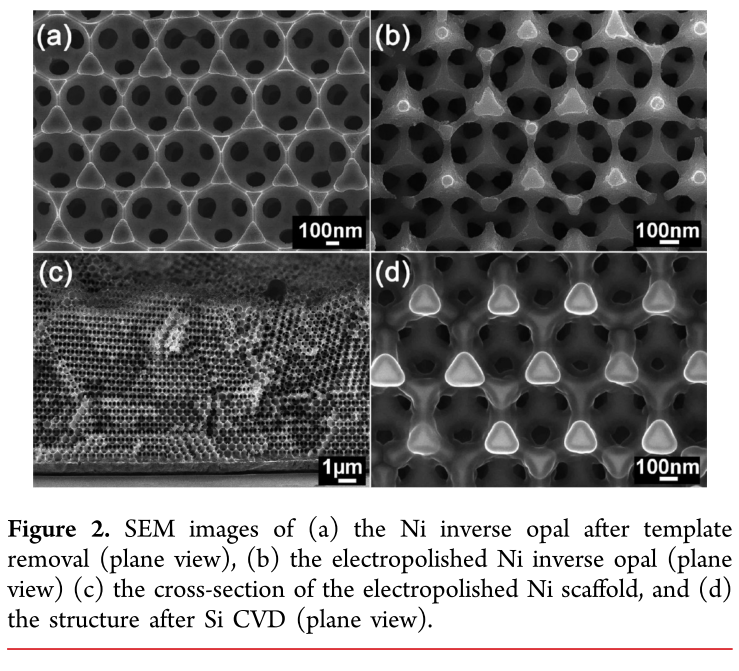 However, these materials have been shown to have substantial improvements in power and capacity retention when fabricated in the bicontinuous inverse opal structure, and further improvements are possible using these or similar designs. Understanding how structure affects strain and phase change will enable better design for future electrode materials, especially those with high degrees of strain such as silicon. This research is financially supported by the U.S. Department of Energy, Office of Science, Office of Basic Energy Sciences, under Contract No. DE-AC02-06CH11357. The research performed in this project occurred at stations 1-BM of XOR-APS and 5-BM of DND-CAT at the Advanced Photon Source, with 1-BM supported by the Office of Basic Energy Sciences and DND-CAT supported by E. I. duPont de Nemours & Co., Northwestern University, The Dow Chemical Co., the State of Illinois through the Department of Commerce and the Board of Education (HECA), the US Department of Energy Office of Energy Research, and the US National Science Foundation Division of Materials Research.